Pendant measures about 2.75" long by 1.25" tall, on your choice of a 14", 16" or 18" gold-filled chain with lobster clasp. Convo me if you would like a different length chain. Model is wearing 16". I hand-sawed my squid design out of copper sheet, and then I etched it with my original drawing in an acid called ferric chloride. After cleaning and finishing the prototype, I made a mold so I can now cast this piece in any metal you like! This listing is for a brass pendant. Each piece is sealed with a clear fixative on the back to prevent oxidation, and also to prevent it from irritating sensitive skin. The front is simply cleaned brass, which is quite easy to care for. See some tips for caring for your brass jewelry here: http://www.eaglerowe.com/how-to-clean-and-care-for-brass-jewelry/ I also include a lightly abrasive polishing paper, perfect for keeping your necklace like new. Would you like a special message on the back? Machine engraving is available for $14 up to 12 characters. Please allow 3-6 additional business days for engraving. Simply select this variation at check out, then add a note to seller at check out with your message, along with any font requests. If you want a longer engraving, please convo me before purchase to confirm pricing. Great gift for your special ocean-lover. Fun Fact: Giant squid eyeballs are the same size as a standard basketball! I love this necklace! Its beautiful and well made. 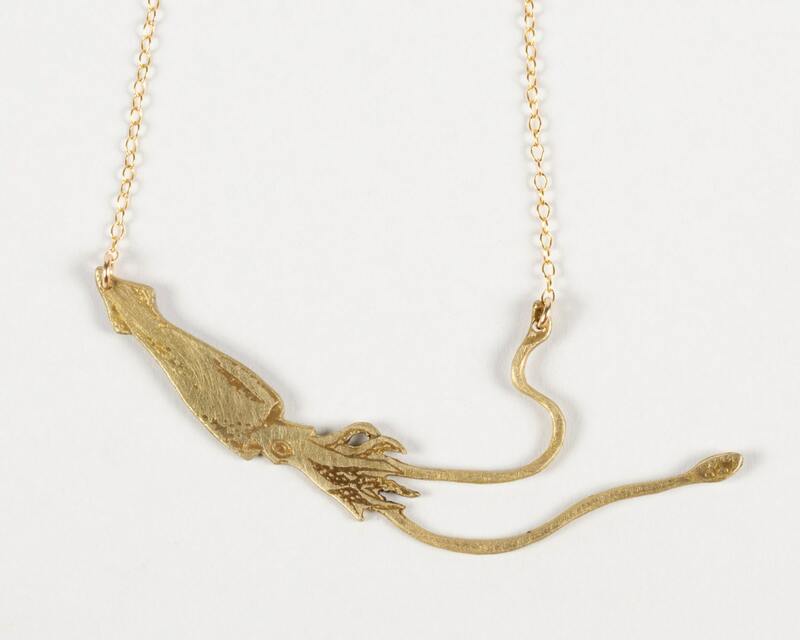 I wear it every day and plan on getting the Sperm whale necklace to wear together as a pair. Very happy. I can't wait to give this! It's perfect! Even though I can't buy from J. Topolski in person anymore, since I've moved away from NYC, I'll keep ordering. She's my favorite jeweler.